Ruger LCP .380 caliber, Basketweave holster case. 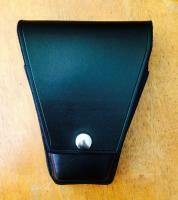 This case is designed to look like a standard handcuff case, but it conceals a Ruger LCP .380 as a back-up firearm. The holster case is custom made with thick holster type leather and has a custom made plastic insert which secures the firearm in place and it helps to keep the shape of the the case. This case will also fit the firearm even if the Ruger LCP magazine has a finger extension, such as the one pictured below. Please note, the firearm is not included. The case pictured has a hidden snap and basketweave finish. The case will come with a standard black plastic snap, unless chrome snap, brass snap, or hidden snap is requested. Also plain finish is available, but please let me know when ordering. Available in plain leather, or basketweave. Please list plain leather, otherwise it will automatically be basketweave. Please list the type of snap. Fire arm is not included. Please note, shipping for this item is $7.50 dollars. Shipping insurance is included in this fee. Hidden snap is available upon request.